Happy Thanksgiving Season! I love the opportunity this time of year affords me to sit down and reflect on all the ways the Lord has blessed me and then praise Him for His goodness. Of course, we should be thankful every day of the year, but I think there is value in having a focused time to do so. I find it makes me more aware of the everyday blessings I take for granted. What bountiful gifts He's given to each of us! 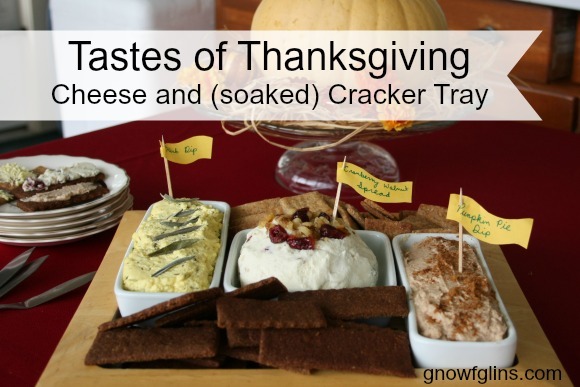 I also enjoy the traditional tastes of this season, such as stuffing, cranberry sauce, and pumpkin pie, so I've taken inspiration from those flavors to put together an appetizer tray of three different kinds of cheese spread and two kinds of soaked crackers, perfect for munching on while waiting for your (pasture-raised!) turkey to finish cooking. 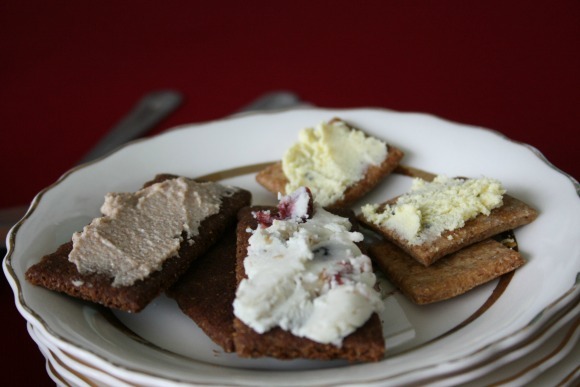 Since one of the spreads is savory, one is sweet, and one falls in the middle, I decided to make savory crackers with a mix of whole wheat and rye flours, and some sweet graham crackers as well. Both recipes are soaked for at least 12 hours before baking to neutralize the phytic acid in the flours — so your body can better utilize the nutrients and digest the crackers more easily. In a medium size mixing bowl, combine flours and sucanat. Using a pastry blender, cut in coconut oil and butter until mixture is well blended and crumbly. Add water and whey, stir until completely blended and dough is moistened. Allow to sit on the counter for 12-24 hours. When you are ready to bake the crackers, preheat the oven to 375 degrees Fahrenheit. Divide the dough in half and roll each half on a floured surface (or between two pieces of wax paper) into 1/8-inches thick squares. If the dough is difficult to work with, chilling it for a half hour prior to rolling it out will help. Using a pizza cutter, pastry wheel, or sharp knife, cut the dough into 1-1/2 inch pieces. Since the crackers will not rise or expand during baking, there is no need to space them out. Sprinkle the dough with salt and transfer to parchment-lined baking sheets. Bake for 10 to 20 minutes, depending on the thickness of the dough. Keep a careful eye on the edge pieces, as they may be thinner than the rest of the dough and will be done sooner. If they are, simply remove them and return the rest of the crackers to the oven to finish baking. The crackers are done when they are golden, brittle, and crispy, and they will crisp up a bit more as they cool. If the crackers still aren't as crisp as you'd like, you can put them in a dehydrator or in the oven at the lowest temperature for half hour to two hours in order to dry them out a bit more. Store in an airtight container. In a medium size mixing bowl, combine flour, sucnat, baking soda, salt, and cinnamon. Using a pastry blender, cut in coconut oil until mixture is well blended and crumbly. Add water, whey, molasses, and vanilla, and stir until completely blended and dough is moistened. Dough will be slightly sticky. Allow to sit on the counter for 12-24 hours. When you are ready to bake the crackers, preheat the oven to 375 degrees Fahrenheit. Divide the dough in half and roll each half on a floured surface (or between two pieces of wax paper) into 1/4-inches thick squares. If the dough is difficult to work with, chilling it for a half hour prior to rolling it out will help. Using a pizza cutter, pastry wheel, or sharp knife, cut the dough into rectangles or large squares, then score “break-apart lines” in your dough by cutting halfway through with a knife or pastry wheel. Since the crackers will not rise or expand during baking, there is no need to space them out. Sprinkle the dough with cinnamon, if desired, and transfer to parchment-lined baking sheets. Bake for 10 to 20 minutes, depending on the thickness of the dough. Keep a careful eye on the edge pieces, as they may be thinner than the rest of the dough and will be done sooner. If they are, simply remove them and return the rest of the crackers to the oven to finish baking. The crackers are done when they are golden, brittle, and crispy, and they will crisp up a bit more as they cool. If the crackers still aren't as crisp as you'd like, and because these are on the thicker side they may not be, you can put them in a dehydrator or in the oven at the lowest temperature for half hour to two hours in order to dry them out a bit more. Store in an airtight container. 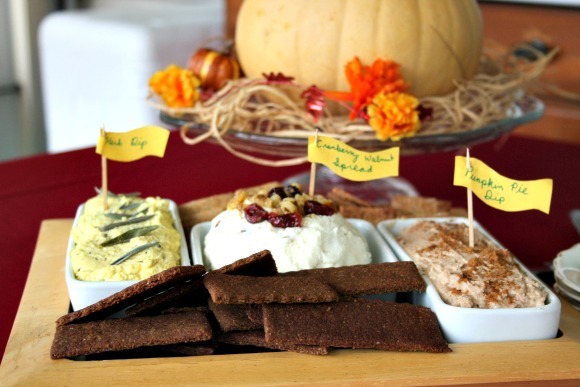 Mmm, I love dips and spreads, don't you? 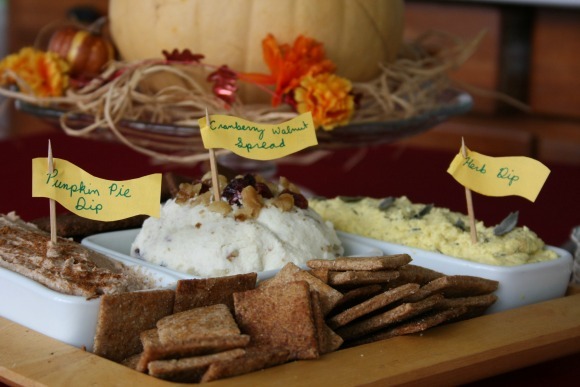 Pictured from left to right: Pumpkin Pie Creamy Cheese, Cranberry Walnut Cheese Ball, and warm Stuffing-inspired Herb and Cheese Spread. I used homemade raw goat cheese (see my tutorial here at The Nourishing Gourmet if you want to make your own!) as a base for all three of these, and added different fruits, nuts, herbs, and/or spices to each one to create three different spreads. In a food processor, combine ingredients and process until smooth and creamy. When serving, garnish with a sprinkle of pumpkin pie spice, if desired. Using a hand mixer, or a stand mixer fitted with the whisk attachment, combine all ingredients until walnuts and cranberries are well mixed. Form into a ball. Garnish with walnut pieces and dried cranberries. Preheat oven to 350 degrees Fahrenheit. Combine cheese, sour cream, egg, and herbs in a food processor and process until smooth. Transfer to a small baking dish or ramekin and bake 20-30 minutes. Serve warm. Have a wonderful Thanksgiving! And just for fun: do you call it “stuffing” or “dressing”? Hi! Are the crackers gluten free? Coz as you soaked them. Looks fantastic!! My mouth is already watering. Thanks for sharing!